I was hurrying to the railway-station and I missed my train. Have you had a similar intuition? Do you believe in reincarnation? Do share. Interesting...so much said in so little words. All the best for WOW. Thanks Viyoma :) Delighted you found it interesting! Accident always takes us back to the past...a good take on the prompt! Welcome here, Padhma! Thanks for reading & sharing. Ah, how opportune that the WOW prompt included a Train this time :D And there you go, successfully combining 3 prompts :) Well done! It all comes together and her story comes full circle. Very nice! Superb take on this prompt. wow..two prompts at one go...genius! You mean the first line, right Ankur? Yes, great when God's plan falls in place! Okay, over to your Blog now. Will post my comment again! I think there are occasions when you know you're home. Two lives in hundred words...really WOW!! Perfect bolywood movie in 100 words!!! Lovely to have you visiting! Thanks for your nice words, Alok :) Makes me say Cheese! It's the same way as you share all those SEO & Blogging tactics with ease! U deserve an applause for this....!!! Glad you liked it, Veena. Everything happens for a reason. Nice one Anita. Have a great day! 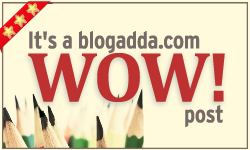 Thanks for sharing & for your WOW, Indrani :) Yay! That's really interesting, I think I have read it before. There is mystic and a soothing calmness in this one.